MICKEY MOUSE Camping with Friends Activity Saucer is rated 4.7 out of 5 by 30. Ah, the magic of the great outdoors… indoors. Imagine all the joys of camping – the lanterns, the canoes, the trees, the S’MORES – without the work. No tent to pitch here! 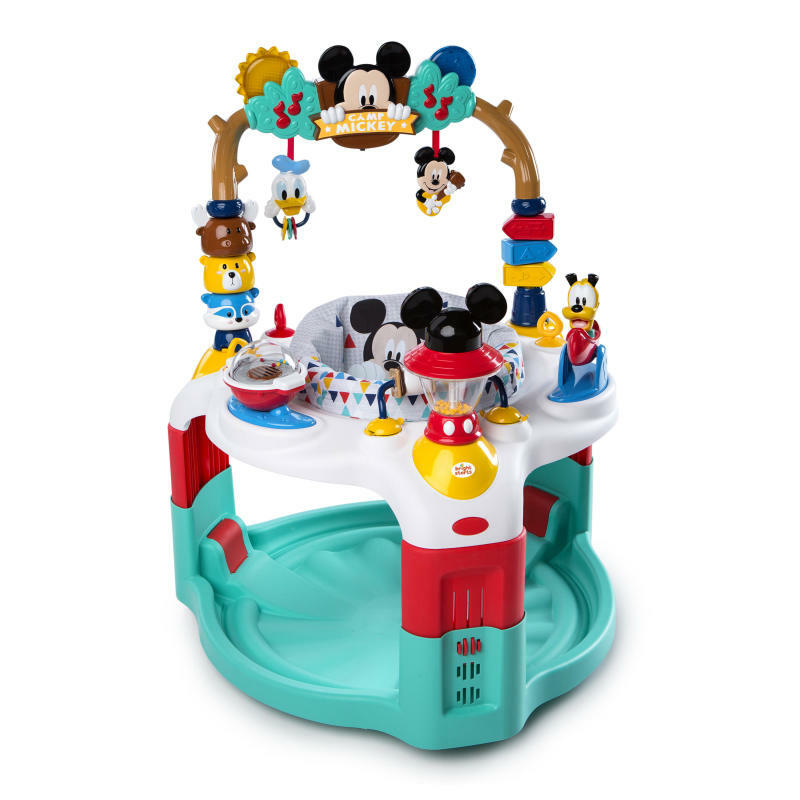 With this activity center, your baby can giggle and play with Disney Baby pals in 360 degrees of fun. The seat rotates allllll the way around, while staying safely in one place. Donald Duck lights up the sun and makes early morning sounds, and Mickey Mouse hangs the moon (cue the cricket sounds). Each gentle tug on the hanging toys activates a Mickey surprise… Watch as Mickey plays “Peek-A-Boo!” from behind his Camp Mickey sign! With this baby activity saucer, you can set up camp with imaginative play from sunrise to sunset. At Camp Mickey, everyone’s a happy camper. Make camping memories right from the living room! Dimension (in) 30" x 28.5" x 32"
Fabric Seat– Machine wash the fabric seat in cold water. Use a gentle wash cycle with no bleach. Tumble dry, using low heat.Plastic Parts – Wipe clean with damp cloth and mild soap. Air dry. Do not immerse in water. Rated 5 out of 5 by ERS from Such a great saucer and a great company! My son loves Mickey and he loves this Camp Mickey Saucer. Lots of activities for him to do, he now loves to pull the Mickey and Donald to see the lights and hear the sound effects. The saucer also has 3 height settings. The makers or this saucer are great too. One of the battery powered items would not work and they sent me a replacement. Thank you so much, my son loves everything on this saucer. I would absolutely buy this again! Rated 2 out of 5 by ChuFam from Love the lights and sound Bought this four months ago at Toys “R” Us before my daughter was born . Love those lights and sound but couldn’t put all the pieces together would not fit . Rated 5 out of 5 by Alison H from Fantastic Saucer! My little girl LOVES this saucer. It has all kinds of things to keep her entertained. I really like how it has things that encourage her to reach up and rewards her with different sounds and stuff moving when she pulls on them. Rated 4 out of 5 by Ashdiggity2000 from Keeps the little man busy as long as I need. My son and I absolutely love the Mickey Mouse Camping With Friends Activity Saucer. It keeps him busy and in sight while I do all those thing that can’t be done with a baby hanging off me. I highly recommend this product to any mother with her hands full. Rated 4 out of 5 by Ashdiggity2000 from Keeps the little man busy as long as I need. My son and I absolutely love the Mickey Mouse Camping With Friends Activity Saucer. It keeps him busy and in sight while I do all those thing that can't be done with a baby hanging off me. I highly recommend this product to any mother with her hands full. Rated 5 out of 5 by Kellyhitt13 from Mickey to the rescue! An excersaucer is ABSOLUTELY something that every parent needs. My LO will sit and stare/play with everything attached. I love that the sound has options to play constantly or just when my LO hits the right button. It was very easy to put together and for it being made out of all plastic, it is very durable. I also love that there are 3 different levels to move up and down from so that my LO will not put grown so quickly. Would 100% recommend. Rated 5 out of 5 by BloggingMama from So entertaining you'll play too! I was truly excited when this came in the mail for us because 1, it’s Mickey Mouse and 2, it’s so much fun for baby to play with! So many things for him to be entertained by and I think it honestly kept his attention for a good 30 minutes before he had enough and was ready to get out of it. You’ve got lights and sounds. What baby wouldn’t want to play with this? Plus of course the chair swivels around to make it easy for baby to get to everything. Pluto makes cricket type sounds as you twist his head and moves up and down when you push on his canoe. You can make a little s’more by pushing each piece together. The fireflies are activated by a gentle press on the top of Mickeys lantern head but if hit a little harder they appear to be popcorn popping I guess. The grill is awesome! You’ve got a hot dog on one side and a hamburger on the other as you roll the little ball you’ll see them both and some tiny popcorn balls again. It’s mesmerizing, even to me. There’s little loops in the back to hook up other toys with rings but my son uses these to help twist around in the seat. The animal heads spin around as well as the signs for camp. The Camp Mickey sign is the most fun as the Donald and Mickey heads activate the music and lights when you pull them. A button on the back can switch from playing continuous music and a few things my daughter calls reactions for daytime and nighttime sounds. The Mickey Mouse fabric can be removed and is machine washable. My 7 year old daughter and I were able to put this together by ourselves but the directions were a bit confusing so we figured it out on our own. That’s really my only small complaint. I recommend this awesome exersaucer if you’re looking for something new and different for your little one or you just really love Mickey Mouse. Thank you for taking the time to read my review!